My phone drowned in the Tresnavica showers and I had to take a zero to buy a new one (no phone, no blogs…). At six in the morning a bus runs from Kalinovik to Sarajevo and it returns at four in the afternoon, which gave me a few hours to arrange the phone, charge and set it up. Asking the bus driver to drop me off just outside of Kalinovik confuses him and another passenger. ‘This is the road to nowhere’. He really doesn’t get me (probably not a hiker) and doesn’t want me to leave the bus. I firmly get up and out, waving at them while they drive of. The first 10 km’s or so out of Kalinovik go through hills and meadows where I find a good flat, somewhat dry and somewhat insect-free spot for bivouac. The next morning getting up and out my warm and comfortable sleeping bag is challenging. Ending with a late start at around nine. The weather, just a little below 100% humidity, doesn’t help. The hike up to Lelija turns out being wet, misty and windy. Out here there are lots of markings making this a fast and easy hike. On my way down to Stirinsko jezero I meet the first hikers since the day leaving Sarajevo; a large group of Tsjech on a camping trip going in the opposite direction. From the lake the markings get scarce, but due to the landscape navigating isn’t very challenging. Oh, and if there’s no mist spectacular views are out here! Because of the rainy weather I quit hiking today upon arriving at Lovacko kucá, which is closed (open by arrangement), but the large veranda with table and benches seems like a four start accommodation, out here and with this kind of weather. It must, at least, be more comfortable than camping at the cold and windy lake just down the road. I get into my comfi sleeping bag early, ending this day like I started it this morning. An almost encounter with Eva, fellow Dinarica hiker, Dutchie and blogger. Hiking the second part of this stage starts misty, windy and rainy: just like yesterday, only with better views. 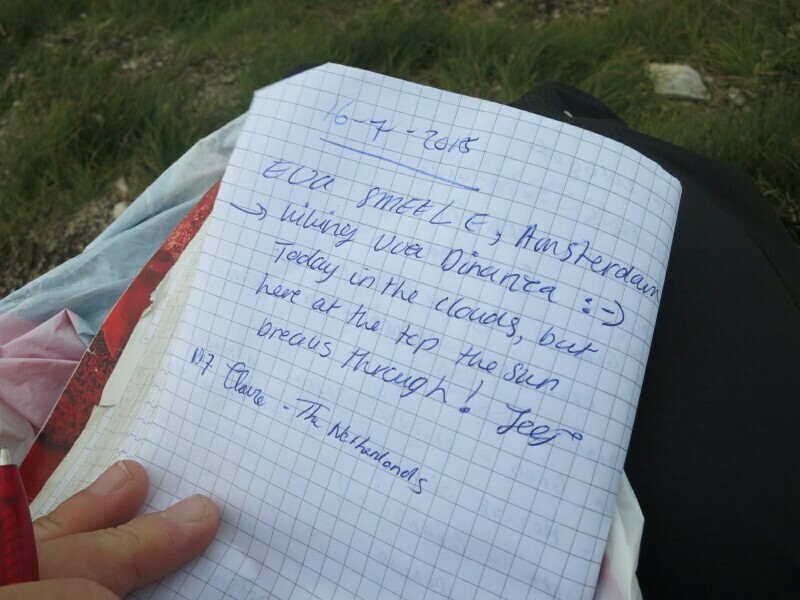 The hike up on Zelengora’s highest mountain, Bregoć, is easy and when entering my name in the register I realize I barely ran into fellow hiker and blogger Eva. It being windy and chilly there’s one thing to do: hike on. And that’s what I do. Slowly the clouds move and patches of blue appear in the sky and I get to enjoy the surroundings while hiking to Donje Bare. At the hut I get to speak Dutch for the first time since leaving the low countries six weeks ago; there’s Dutchies staying at it and a log is left burning in the fire ring at the nearbut picnic area. I collect wood and make a big campfire to dry my trail runners and warm my feet. Support my adventures and buy me a carbonated and sugary soda pop or a strong coffee.